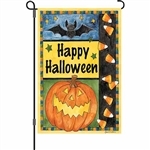 Scare up a great Halloween decoration! 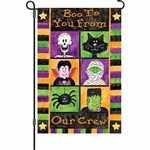 We carry a large selection of Halloween garden and standard size flags. 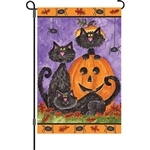 FLYING WITCH Decorative Standard Size Flag - 28" x 40"
HALLOWEEN SMILES Decorative Garden Size Flag - 12" x 18"
Painted Pumpkins Decorative Flag - Standard 28" x 40"
Painted Pumpkins Decorative Flag - Garden 12" x 18"
Pumpkins and Gourds Decorative Flag - Standard 28" x 40"
Pumpkins and Gourds Decorative Flag - Garden 12" x 18"
Welcome Stack Applique Flag - Garden 12" x 18"
Trick or Treat Applique Flag - Garden 12" x 18"
Jack O'Lanterns Applique Flag - Garden 12" x 18"
Hello Halloween Decorative Standard Size Flag - 28" x 40"